There'[s less than a week to go before Christmas. It’s too late to find anything online without paying out the wazoo for shipping. You’d rather chew off your arm just below the elbow than try to fight the traffic at Southridge. And, you’d like to support local artisans and business. Here’s what you can do. The PopCulteer brings you a list of great last-minute gift ideas that are right up your alley. Legends of the Mountain State is a trilogy of ghostly anthology collections feauting stories set in West Virginia.. Michael Knost is chief editor and coordinator, and in the third installment you’ll find 13 final chapters of bone-chilling ghost tales and treacherous legends. Stories are penned by many of the preeminent writers in the business. The tone in this project is perhaps darker, tales creepier, and the overall texture even grittier than the first two installments. The thrid volume includes a foreword by Homer Hickam, one of America’s most beloved authors. Contributing authors include Elizabeth Massie, Michael West, Scott Nicholson, John R. Little, Brian J. Hatcher, Kelli Dunlap, Matt Venne, Douglas F. Warrick, Steve Vernon, Fran Friel, Matthew Warner, Mark Justice and J.G. Faherty. You still have time to get your copy personally signed by editor Michael Knost and contributor Brian J. Hatcher. Both will be on hand today at Taylor Books in Charleston from 2 PM to 4 PM and at Borders in Barboursville Mall from 6:30 PM to 8:30 PM. And on Saturday from 2 PM to 4 PM at The Borders in The Charleston Town Center. Knost and Hatcher will be there to sign all three editions of egends of the Mountain State series, plus the Writers Workshop of Horror, and the new title, Appalachian Winter Hauntings. 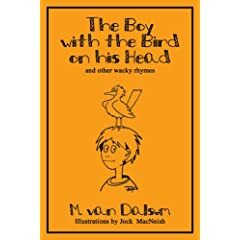 “The Boy With The Bird On His Head” by Mariel Van Dalsum takes us to a world of rhyme and humor in this hilarious collection of wacky poems. Will the girl who lost her hiccups ever find them? As for the tooth fairy with no sense of direction, will she ever learn how to read maps and get to her destinations on time? Find out the best part about skating on a canal and important things like that. Find the answer is this whimsical collections of poems and short stories. You can find it at Taylor Books. 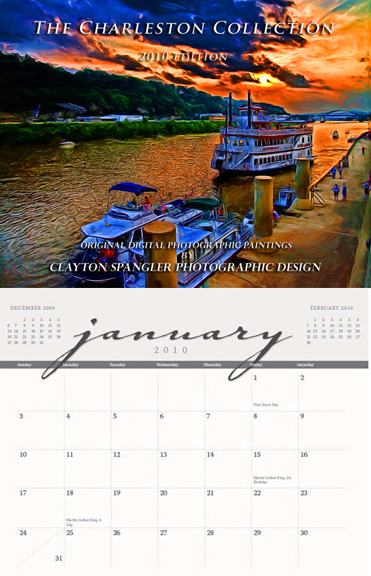 Clayton Spangler recently delighted crowds at The Art Emporium with his “Scenes Of Charleston” show of digital paintings. 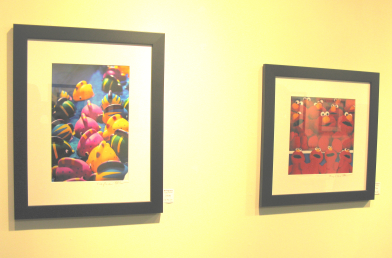 You can check out more of his work on his 2010 calendar, which can be purchased at The Art Emporium or from his website. 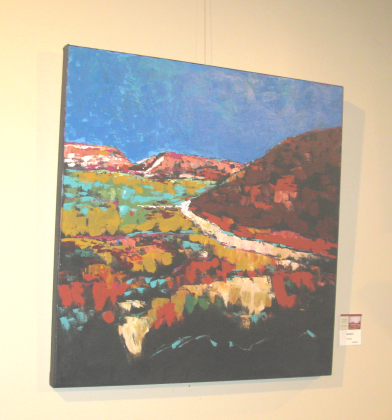 Clayton’s work show’s the Capital City in a whole new light, with an incredible balance of color and a perspective that comes from a true painter’s eye. 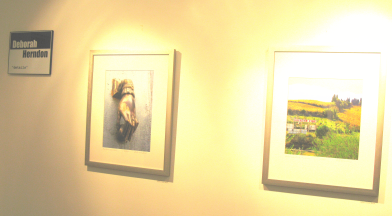 Well-suited to a calendar, this is art that you can lose yourself in for a month at a time. 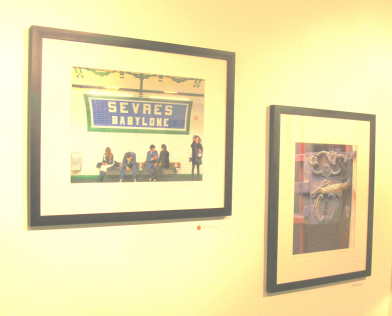 Riley Vann’s photos of Coney Island, currently on display at The Art Emporium, are also available there as a calendar. 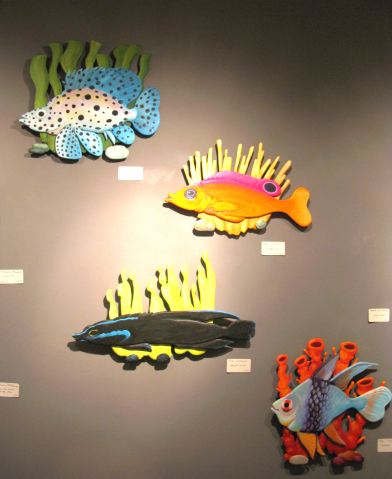 There is cool art by local artists available all over town. You’ll see some of it later in this column as we look back at last night’s Art Walk, but we’re going to zero in on a few cool things. 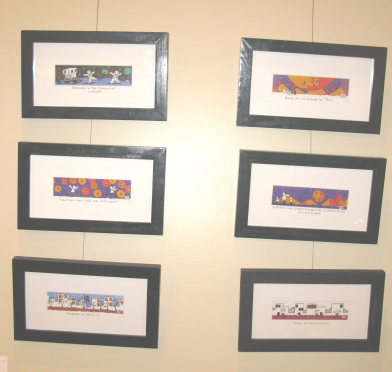 …or postcards and beautiful limited-edition prints from Deborah Herndon. 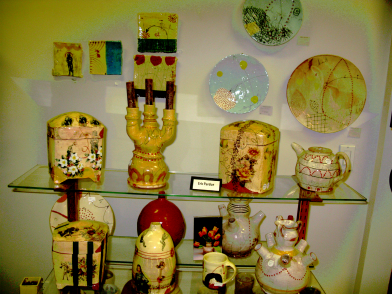 You can also find details on Deborah’s work at her website, and you can find her note cards and recipe sets at the shop at The Culture Center. 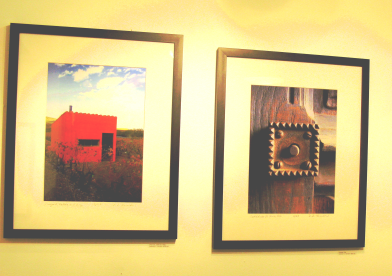 Check her website for a closer look at her amazing photography. 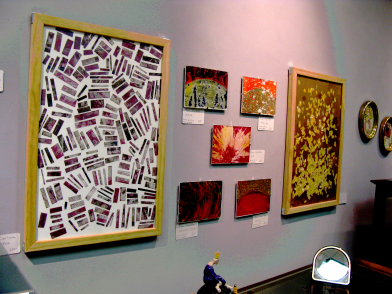 Also at The Purple Moon, you can find work by Sharon Lyn Stackpole and some really great new prints of 1950s-era work by Felix Krasyk, which can be seen in the background of the Christmas episode of RFC. 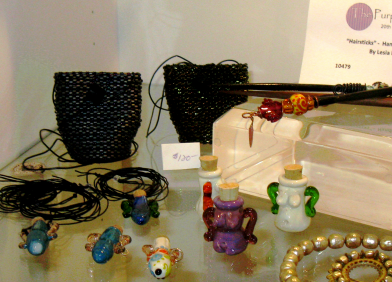 You may also get a kick out of the jewelry by Melissa Tyson. 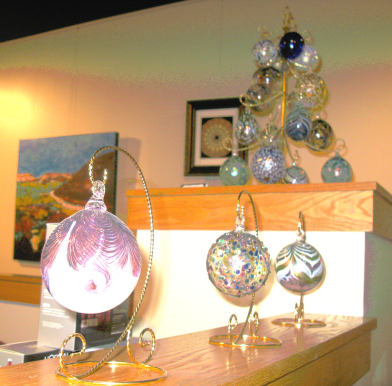 At Visions Day Spa, you can find some lovely glass ornaments by Ron Hinkle. Taylor Books has a great selection of work by Eric Pardue, plus if your’s shopping for kids, check out the Kreeture Komforts gang by Amy Williams and Mark Wolfe. It’s been a banner year for local music. You can find quite an assortment at Budget Tapes and Records, Taylor Books and The Convenience Store. Among the cool CDs released this year…. “One Man’s Trash” by Tofujitsu– wonderfully-crafted melodic pop with a message. “Redeeming Metal/Union” by The Scrap Iron Pickers–progressive metal. Heavy instrumental music with an all-star line-ip of guest musicians. “Wasted Words & Best Intentions” by Bud Carroll and The Southern Souls–Mountain State melting pot music, as Bud melds a variety influences from blues to country to power pop into a satisfying new sound. “My Lost And Found” is the most recent CD by master singer/songwriter (and current RFC guest) Todd Burge. It’s excellent. That’s all you need to know. 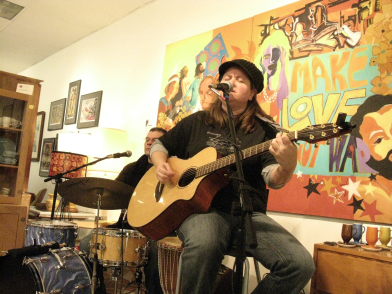 There are many,many more noteworthy local musicians. I implore you to seek out the local music selection at the aforementioned retailers to check out and support the local music scene. If you know of some other noteworthy local books, CDs, Calendars, Art, or other items, please feel free to plug them in the comments section. 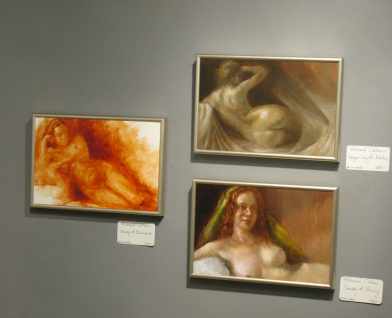 Work from Dan Carlisle, Rob Cleland and Richard Cohen at Taylor Books. 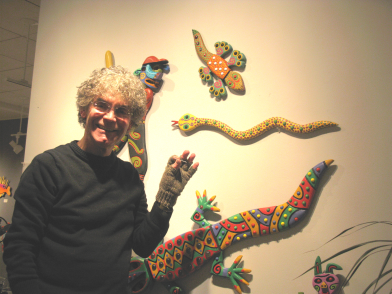 Charlie Hamilton with his work at Taylor’s. 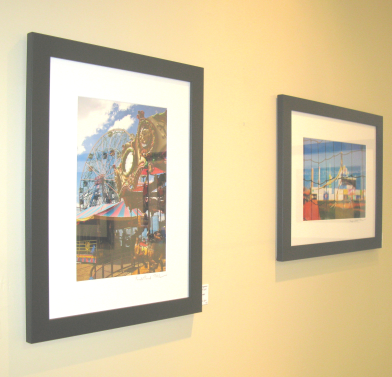 Riley Vann’s cool Coney Island photos at The Art Emporium. Tofujitsu at The Purple Moon. 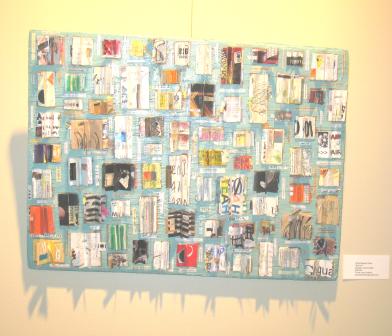 More work by Deborah Herndon. 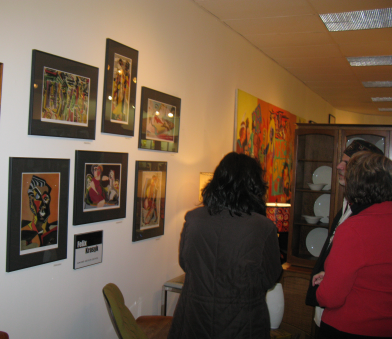 Folks checking out Felix Krasyk’s prints. Tofujitsu again, viewed through the aluminum forest. Just skimming the calendar, there are three notable cool events to hit this weekend. First, RFC guest Todd Burge is at Bruno’s on Leon Sullivan Way Friday night at 9 PM. 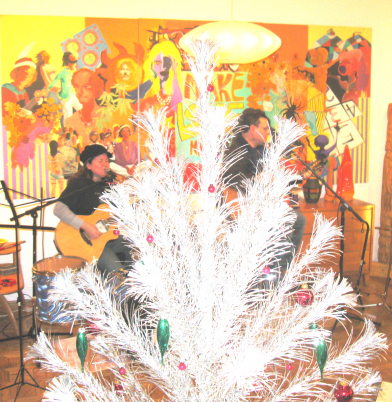 Then Saturday, 12-String guitar master Josh Buskirk is at Taylor Books. There is no cover for either event. On Sunday, Un Unitarian Universalist Congregation celebrates The Winter Solstice with a Ball on Sunday evening. There will be a drum circle, fire ritual and “Third Eye Musical Cabaret with an open mic and The Clementines. 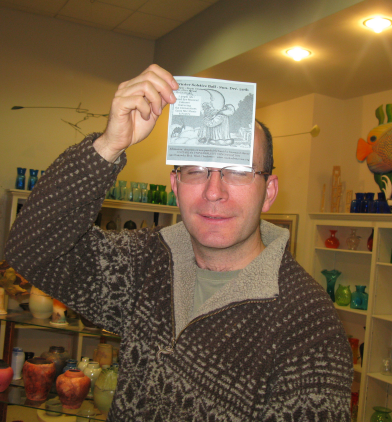 You can read more about it here, and check out UUC’s Chris Higgins below, using a flyer for the Winter Solstice Ball as a makeshift fedora. We recently lost Irving Tripp, who provided the finished art for John Stanely’s classic comic book, Little Lulu. If you don’t know why this series is considered such a masterpiece, read up on it, then check out the collections from Dark Horse. These comics are epics on par with Carl Barks’ famous Uncle Scrooge stories. Merry Christmas to all, and to all a short week. You may just see a PopCulteer on a different day, with photos from the recent Buswater show, and your PopCulteer venturing into restaurant reviews.